A favorite neighborhood sushi spot on Hancock Park's Larchmont Boulevard. 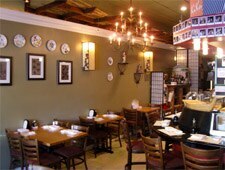 : Nestled among the boutiques and modest restaurants of Larchmont Boulevard is Kiku Sushi. Though it is Korean-owned, the cooking remains traditionally Japanese. The menu offers a selection of teriyaki, sushi and sashimi, as well as specialty rolls like the "Treasure Island," made with crab meat, cucumber, avocado and salmon tempura, topped with fresh salmon and lemon. Patrons often choose to dine outside on the sidewalk, to take in the sunshine or possibly spot a celebrity.